I guess the pulleys will be easy to get new ones, they are pretty standard things. The last ones I had for a machine (a Wheelhorse as it happens) turned out to be standard size and then the company just drilled out the centres to the correct shaft diameter. Tyres though will be harder to get. As you know they are hard rubber that is bonded around a pressed steel centre. Some Mustangs had optional (and highly recommended!) pneumatic tyres although I don't know what they were like, mine just had the hard rubber ones. Just came across a mowette mustang in Austalia!. The owner was nice enough to give it to me. I figured out later on as i was pulling the spark plug out that the engine was full of water, and would need a complete rebuild. Im in the middle of doing that now and looking forward to restoring this little beauty. Ill try and get some photos up soon. finally got around to uploading these photos of my mustang. different sticker to the other mustangs on this forum? green painted motor? all is original as far as i can tell. motor was full of water unfortunately. from years of sitting in the weather. These Mowett Mustangs were exhibited at the Anglesey Vintage Rally in May 2009. They belong to Vic Tolhurst from Amlwch, Anglesey, who was the Horticultural Steward. need tires and choke cable, any ideas? _popupControl(); looks like they upped the anti with the 1979 model alan !!! it got the 8hp b&s engine !!! I just bought an 8hp Mustang off e**y, seems to be in amazing condition, and a bargain price of £47!!!! I will add pics as soon as I get it and start to restore it. I can't believe I got it so cheap! I have been looking for ages and sometimes, don't ask me why, they go for silly money. Well done, £47 is not dear, good luck with the restoration !! Well, I got the little Mustang home, 200 mile round trip took me 7 hours!!! (they shut the A14 - fantastic!). I also saw another one on e**y (just like buses! ), so I bid on it an won it, £77! !, so now I have 2. They are both 8hp models with rear differentails. The first one was bought from a guy who actually races lawnmowers, and he showed me his racing mower. I must say that they are quite heavilly modified to race, although the engine has to stay original. Anyway he had welded 2 short pieces of tube to the front axle to carry the front steering arms as they had worn with use. It looks like a good upgrade and I will probably do the same to the second Mustang when I get it. I also bought 2 litres of yellow Hammerite smooth paint which I intend to use on the bonnet/seat etc. I seems to be a reasonable match and is definately the easiest option as far as paint prep goes. I now I said it already but I will put some pics on as soon as I can. I'm happy to see there is still interest in these mowers. It's spring, so I'm going to attempt to do something to mine. It's just sitting there. I just found this on Craiglist. Hi there jspurlock and welcome to the forum i tried to see you link but was unable to follow this !!! but can tell that its a advertising site for salt lake city and the surrounding areas maybe you can paste the pictures of the machine advertised !! i hope you enjoy your time on the forum and look forward to may more posts in the future !!! Just got myself a Mustang too! First post here too! I think Alan will agree with me here, just got the thing for £0.99. I kid you not. Only problem is Im in Scotland, and its in the South of England. I'll sort something out. Always wanted one of these, but they always went for alot more than I wanted to pay. This on the other hand went rediculously cheap. Anyway, Im gonna restore it on the most part probably, but use go kart wheels and tyres instead. Its got a 5hp Briggs, which doesnt run. Will do once Im done though. That's all I gotta say right now, later guys! Well done chunk thats a great buy !!! pity it so far away but im sure that you will get it sorted out somehow !!!! any way welcome to the forum and hope you keep it touch and updated on the progress of this machine !!!! P.s. im based in Norfolk and im going to Brighton next week don,t know if this could be of use to you !!! Well, I have a friend of mine from youtube picking it up and storing it for me. It just so happened that the mower was really close to him. Im planning to go down to Gloucestershire to see some old friends in the summer, Was thinking of maybe going down to East Sussex then to pick it up. Still a long long way though. Anyone tried posting one of these? I shouldnt think it would cost too much, then again it could be insane. I was looking at putting a 3 speed onto it to. Used 1st for cutting, and 2nd / 3rd for cruising along my lawn ;) Cant wait to get my hands on it. Thanks for your offer too, Although I still think it would be out of my way. Appreciate it though! no worries i kinda guessed you would have it covered !!! good luck with the mustang !!!! I would think that it would be the cheapest way !!!! especially with the price of diesel !!!! unless really local these days i just dont have time to run round the country so if its a long way off i say to people if they are unable to put it on a pallet i cant buy, sure sometimes you miss out but usually people will help, with a vechile thats big enough to move something like we collect think how soon you would use £50 worth of diesel? I know this only to well at the moment as i'm without a car scince it blew up and am using the works nissan cabstar, problem is its only doing about 20 mpg on the country lanes where i live- ouch! Yes the Mustang looks like a bargain to me! Not sure where you will be able to source the missing wheel from but I'm quite sure that there will be similar wheels available so there's the possibility of just getting a new front pair that look ok.
Looks a good project anyway, I'll be interested to see it when it's all finished! Just out of interest where abouts in Scotland are you? 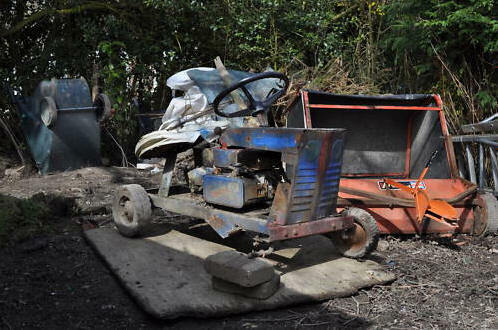 I did look up Mustang Mowers on our favourite auction website and there were three sold recently including this one. But one seller was also selling a Pacemaker mower by john Harston Ltd of Norwich. This Pacemaker appears to be almost mechanically identical to the Mustang apart from a different bonnet and handlebars instead of a steering wheel. Same type of chassis, seat, seat support, gearbox and chain drive, same wheels etc. Different mower deck and engine support though. Anybody know anything about this company?? Alan: That Pacemaker is cool! What site was that on? Pretty cool. I'll look into a courier. As I think I said, time is no issue for me. Still waiting on the guy to email back though! Just got his phone number from e**y so I'll give him a phone. I can definitely remember Harstons supplying my late father with horticultural machinery/parts, but none of the few invoices I have left are from them. Can't find any reference in old Kelly's but haven't got later than 1922!. Nothing on the net either. Anyone know of a reliable, fairly cheap courier that would handle a mower like this? Really not sure where to start looking. It;s being collected this sunday. So hopefully I should be able to find out it's weight from my friend down south too.